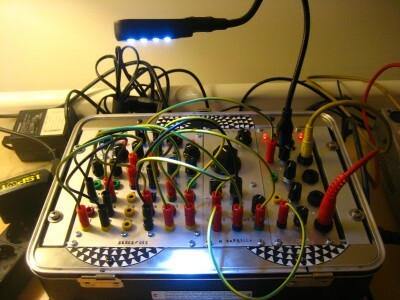 This demo is an edit of three settings from the Macumbista Mini synthesizer: http://macumbista.net/?page_id=623 The Mac Mini uses two cross-modulated Voltage Controlled Slopes through an Analog Logic module and a pair of Polivoks Voltage Controlled Filters. Feedback from the audio mixer is returned to the control section of the VCS modules. This entry was posted	on Thursday, June 3rd, 2010 at 16:50	and is filed under Documentation. You can follow any responses to this entry through the RSS 2.0 feed. Both comments and pings are currently closed. Powered by WordPress v 5.0.2. Page in 0.441 seconds.